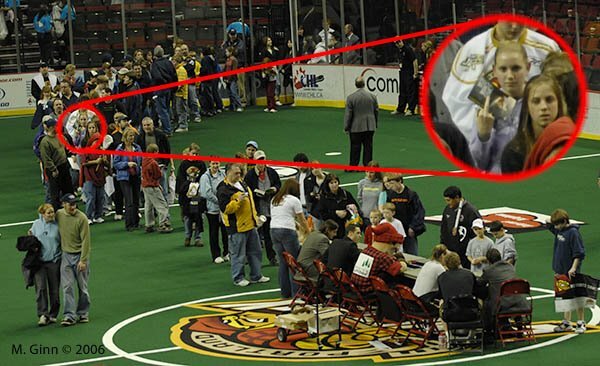 Portland got a new National Lacrosse League team for the 2006 season, and they had their inaugural home opener was at the Rose Garden on January 21. 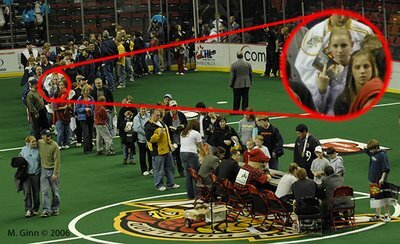 After the game (which Portland won), fans were invited onto the field to collect autographs from a number of the players. Even though I was up in the stands, a long way from the line of fans, somebody apparently saw me taking the picture. The LumberJax went on to finish the season on top of the West Division standings, but lost in the first round of the playoffs. The 2007 season kicks off December 30 in Portland.